BREAKING: For First Time Ever, Plug-In Electric Vehicle Sales Eclipse 100,000 In One Year In U.S. In updating our monthly EV sales chart with the latest data for November 2014, we noticed a 6-digit number that we'd never before seen in a single calendar year. 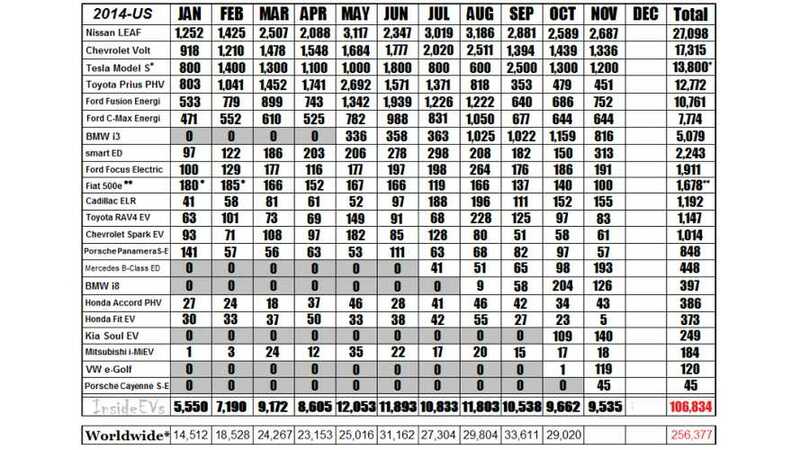 That number, 100,000, represents a first for the U.S.
With November data now fully reported, plug-in electric vehicle sales in the U.S. already check in at a estimated 106,834 units for 2014. That bests the 2013 mark of 97,507 by a substantial margin and there's still a full month of sales left before 2014 is officially in the books. Tell your EV-loving buddies. Plug-in electric vehicles sales are up. A major sales milestone of 100,000 units in a year was just surpassed. Heck, tell the world. This news is worth sharing with everyone. You can follow all the plug-in sales (as well as a write-up on each model's progress individually) in real time as they are made available on our "Monthly Scorecard", which can be found here.